Our homes are important to us for many reasons. They are the place where we can relax, where we gather with those who are the most important to us, and they are the location where we keep many of our most valuable possessions. Our home is, in many cases, also one of our biggest investments. Having reliable locks and the proper security is a must and something that we often take for granted until sometime unfortunate happens or we are in need of a security upgrade. Whether you are locked out or need your home rekeyed, you can rest assure that there is a local locksmith that you can rely on. We at Affordable Locksmith of Texas understand that you could call any residential locksmith and for this reason we set high standards for ourselves and do all that is in our power to give you the best service possible. We invest in the proper tools to perform each and every service correctly and we only hire those local locksmiths that have been properly trained and are upstanding citizens of their community in The Woodlands. We promise that when you call us you will be guaranteed professional and high-quality residential locksmith services. Your local locksmiths of Affordable Locksmith of Texas offer comprehensive residential services. We can repair and install older, traditional locks, but also have the tools and expertise to install and repair commercial locks as well. Below are some of the services we offer to The Woodlands. However, if there is a service you need that isn’t listed, contact us! Chances are we can help you or at least direct you in the right direction to get the help or service your need. 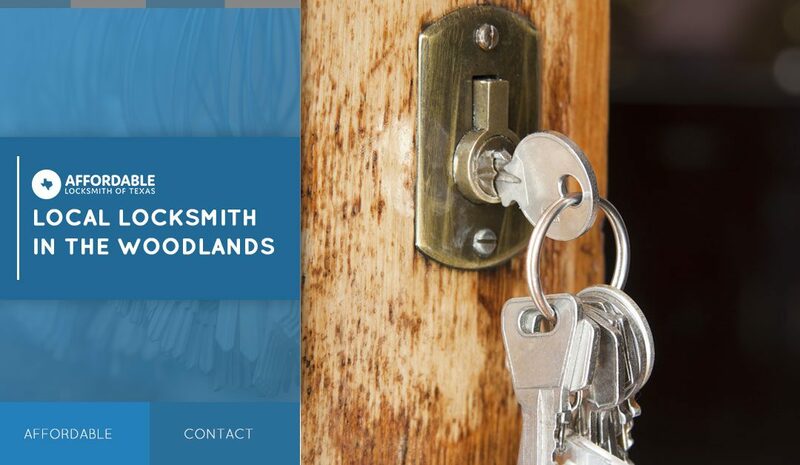 Are you in need of residential locksmith service in The Woodlands area? Contact Affordable Locksmith of Texas, your reliable local locksmiths. We guarantee that no matter if you are locked out or if you need to upgrade your security, we will always respond within 15 minutes of your call or inquiry. First time clients get 10 percent off their first service. If you are looking for locksmiths who truly care about their clients, who arrive on time, and show up with the proper tools, professionalism, and customer-service attitude every time, contact Affordable Locksmith of Texas today!